The Central Bank Governor crisis has been dominating the political landscape at a national level for the past few weeks. However other issues too have surfaced at sub-national level. For instance the question of Muslim political leadership has been causing much controversy at a regional level in the Eastern Province. The Sri Lanka Muslim Congress (SLMC) is the acknowledged premier political party of the Eastern Muslims. Rauff Hakeem - Minister of City Planning and Water Supply – is the accredited leader of the Muslim Congress. In recent times, fresh political challenges have emerged in the East against the Muslim Congress chief’s leadership. Political challenges to his leadership are nothing new to him. He has had to face much treachery and many conspiracies from the time he donned the mantle of Muslim Congress leadership after the untimely demise of SLMC co-founder and leader, the charismatic M.H.M. Ashraff in 2000. Hakeem has successfully weathered such revolts and intrigues in the past and ultimately triumphed. A significant difference this time is the fact that Hakeem is without two of his most trustworthy and dependable lieutenants at the present juncture. Furthermore, a substantial portion of the present problems faced by the Muslim congress chief have been directly or indirectly caused by these two SLMC stalwarts who were at one time devoted Hakeem loyalists. The SLMC is in the grip of an internal party crisis caused by disputes among its leader Rauff Hakeem, party Chairman Basheer Segu Dawood and General Secretary Mohammed Thambi Hassan Ali. What appeared to be a three-way split earlier has in recent times undergone changes after a political re-alignment of sorts between Segu Dawood and Hassan Ali. This convergence of interests by the “Thavisaalar”(Chairman) and “Seyalaalar”(secretary) have virtually isolated the “Thalaiver”(leader) in the triangular tussle. This prevailing state of affairs in the SLMC has saddened party supporters and gladdened those opposed to it. Basheer Segu Dawood of Eravur in Batticaloa District and M.T. Hassan Ali of Ninthavur in Amparai District were regarded as the right and left hands of Rauff Hakeem at one time. All three had resigned their MP seats and contested the Eastern Provincial Council elections together in 2008. Hakeem, Dawood and Ali led the SLMC lists of candidates for Trincomalee, Batticaloa and Amparai Districts respectively. The SLMC did very well and all three topped the preference vote tally in their respective districts. The provincial administration however was formed by the United Peoples Freedom Alliance (UPFA). Sivanesathurai Chandrakanthan alias “Pillaiyaan” became the Chief Minister, while Hakeem and Hassan Ali returned to Parliament as national list MP’s; Segu Dawood remained the Provincial Council Opposition Leader until the 2010 election. Thereafter he too became an MP. While Hakeem got elected to Parliament in 2010 from the Kandy District, Hassan Ali and Segu Dawood were appointed from the national list. When elections were held in 2015, Rauff Hakeem contested again on the UNF ticket under the elephant symbol from the Kandy District. Segu Dawood and Hassan Ali did not contest polls. Since the SLMC had been promised two national list slots, the general expectation was that both would be appointed national list MPs. Complicating matters further was the hope in several Muslim majority areas that a representative from each of their regions would get a national list MP position. None of these expectations and hopes has been fulfilled or realised so far. In a confounding political manoeuvre, Rauff Hakeem appointed his own brother Dr. A.R. A. Hafeez and a Kandy-based lawyer M. H. M. Salman as national list MP’s. It was said that the appointments were temporary and that the national list MP’s would give way if and when the SLMC leader wanted to replace them. After some months Dr. Hafeez resigned. Former Parliamentarian M. S. Thowfeek from Trincomalee District was appointed in his stead as national list MP. Despite intense pressure from Eastern Province SLMC members to do so, Rauff Hakeem is yet to replace Salman with another. Incidentally national list MP Salman is from the Malay community. The denial of National list MP appointments to Hassan Ali and Segu Dawood have led to the political estrangement with Rauff Hakeem say party circles supportive of the Muslim Congress leader. In a bid to justify Hakeem’s actions, his loyalists point out that Amparai District MP Faizal Cassim, like Hassan Ali, is also from Ninthavur. Appointing Hassan Ali also from the same place would have given two MP’s again to Ninthavur. This would have caused resentment in other Muslim majority regions deprived of Parliamentary representation they point out. Similar arguments are made in the case of Basheer Segu Dawood as well. The SLMC Chairman is from Eravur in the Batticaloa District. Likewise the Batticaloa District SLMC Parliamentarian Seyed Ali Zaheer Moulana is also from Eravur. So too is the SLMC Chief Minister of the Eastern Province – Zainulabdeen Ahamed Nazeer. Making Segu Dawood also a national list MP, would have given Eravur too much of political representation it is argued. Muslim Circles close to Segu Dawood and Hassan Ali refute these assertions. They point out that had Hassan Ali contested the 2015 polls, he would have been elected and not Faizal Cassim. Hassan Ali was requested not to contest by the SLMC leadership in order to ensure Cassim being elected. The understanding was that Ali would be made a national list MP. In the same way Basheer’s supporters say it was Segu Dawood who brought in former UNP parliamentarian Ali Zaheer Moulana into the SLMC. This was based on the understanding that Segu Dawoood would be made national list MP, while Moulana would contest at the polls and get elected. What irks Hassan Ali and Segu Dawood most is the campaign by the Rauff Hakeem camp to portray the current crisis as being due to resentment on their part over the denial of national list MP appointments. The crux of the matter is what they term as the increasingly autocratic conduct of party leader Rauff Hakeem. The highest decision making body in the SLMC is the “Athi Uyar Peedam” or High Command. This is supposed to function as a consultative council adopting “Shoora”(consulting each other) principles and making collective decisions through consensus. By enlarging the composition of the ‘high Command’ under the guise of broad basing, Rauff Hakeem is accused of bringing the structure under his control. Currently the High Command consists of around 90 persons. Of these about 60 to 65 are said to be subservient acolytes of Rauff Hakeem. On many occasions, the ‘High Command’ simply delegates full authority to the SLMC leader to make final decisions. Thus the SLMC leader is able to take arbitrary decisions with the rubber stamp approval of the ‘High Command’ say Hakeem’s critics. A case in point is how the powers of Party General Secretary Hassan Ali were curtailed. Apparently an administrative secretary was appointed to the ‘High Command’. It was a paid position unlike that of the General Secretary. Initially it was supposed to reduce the functional burden of the General Secretary. However, the General Secretary was sidelined and the leader began utilising the administrative secretary alone in most party matters. There were even moves to entrust the administrative secretary with the responsibility of dealing with the Elections Commissioner and Parliament Secretary General in an official capacity. This attempt to downsize the powers and authority of his post as General Secretary is what has irritated Hassan Ali most say circles close to the veteran Muslim Congress leader. While differences between Hassan Ali and Hakeem are a comparatively recent phenomenon, the tensions between Rauff and Basheer have a longer history. It was during the phase after the 2008 Eastern Provincial poll that differences emerged between the duo. It is said that Basheer was annoyed over Hakeem and Hassan Ali abandoning the Provincial Council and returning to Parliament as MPs leaving him behind to be Opposition Leader in the East. Thereafter he changed his approach and focused on attaining maximum power at the Government level. Segu Dawood also cultivated top Government Ministers like Basil Rajapaksa. Gradually Basheer got closer to the upper echelons of the Mahinda Rajapaksa Govt. Shortly after the 2010 elections, Basheer hatched a conspiracy to make some Muslim Congress MP’s defect to the Govt on the eve of the 18th Constitutional Amendment to help provide a two thirds majority to the Govt. Having got wind of it, Rauff Hakeem himself personally met then President Mahinda Rajapaksa and pledged support on the party’s behalf. Thereafter the SLMC joined the Govt. Hakeem became a Cabinet Minister and Basheer, a Deputy Minister. A few months later, Basheer was also appointed a Cabinet Minister. He was accused of going behind Hakeem’s back and acquiring a ministership. When the matter was raised at the party ‘high command’ meeting, Basheer replied without batting an eye lid that it was a complete surprise to him too. At that time, Hassan Ali was strongly backing Rauff Hakeem. Elections to the Eastern Provincial Council were held again in 2012. There was a tussle between the UPFA and Tamil National Alliance (TNA) to form the provincial administration. Both sides wanted SLMC’s support to form a majority. Basheer wanted to be with the UPFA Govt. while Hassan Ali wanted the SLMC and TNA to form a joint Govt. Finally, Hakeem opted to support the UPFA Govt. in which he was functioning as a Cabinet Minister. Another problem arose when Maithripala Sirisena quit the Govt and became the Common Opposition candidate for the 2015 presidential elections. The SLMC took a long time to decide on which candidate the party was going to support. Again there was an intra-party tug-o-war with Basheer Segu Dawood opting to back MR and Hassan Ali supporting Maithripala Sirisena. Caught between contending viewpoints, SLMC Leader Hakeem was in a quandary. 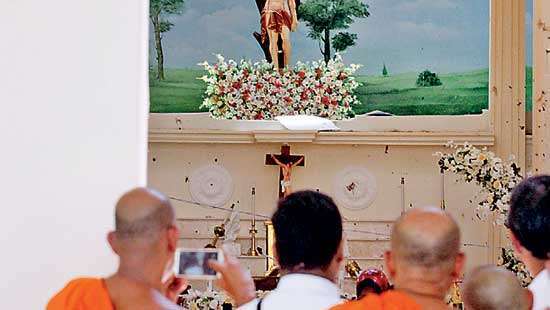 While the SLMC vacillated the Muslim community assailed by the anti-Muslim antics of organizations like the Bodhu Bala Sena (BBS) was in an overwhelmingly anti-MR mood. The SLMC was compelled to support Sirisena against Rajapaksa and then join the new Good Governance Govt. Hakeem became Cabinet Minister and Hassan Ali a Minister of State in the Sirisena- Wickremesinghe regime. It was perhaps this unpleasant experience of being pressurised by Basheer Segu Dawood and Hassan Ali at critical political junctures that may have influenced Rauff Hakeem’s decision to deny national list nominations to both the SLMC Chairman and Secretary after the 2015 Parliamentary elections. 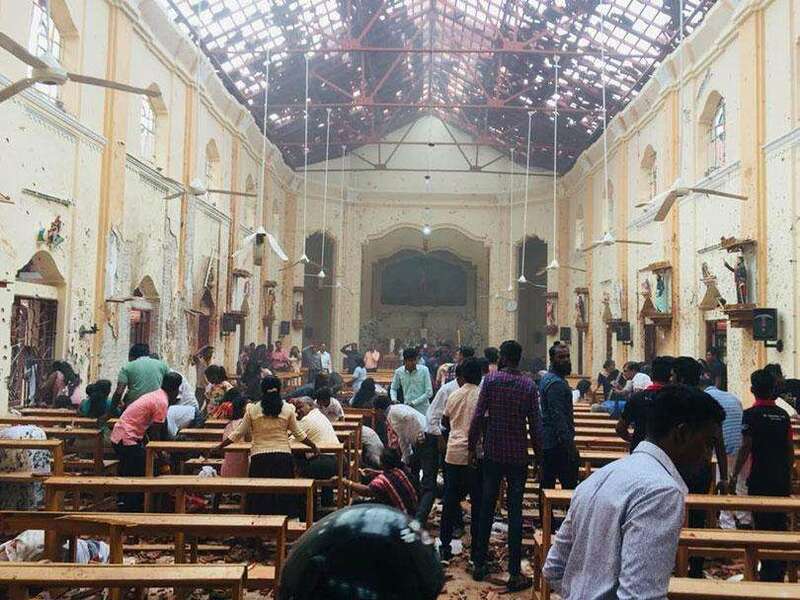 Since there was little love lost between Basheer and Hassan Ali, the SLMC Chief may have calculated that both would reel under the blows separately. What seems to have happened is a case of adversity making strange bedfellows. A convergence of interests has evolved between party Chairman and Secretary. Basheer has come out openly in support of Hassan Ali saying a grave injustice has been done to the SLMC Secretary. When the SLMC convention was held at Paalamunai, both engaged in coordinated action. While Hassan Ali kept away, Basheer attended the conclave clad in attire reflecting party colours. In a tactical bid perhaps to break the Ali-Basheer alliance, Rauff Hakeem sent out an olive branch to the SLMC Secretary. The SLMC leader did not make any overtures to the party chairman and focused only on the SLMC Secretary. Initially it appeared that the “peacetalks” between Hakeem and Hassan Ali had succeeded. Both voluntarily embraced and departed amicably after arriving at a compromise. The euphoria did not last long as the understanding soon crumbled. Later Hakeem was to accuse a “third party” of sabotaging the rapprochement reached with Hassan Ali. Though no names were mentioned, there was very little doubt that the target of Hakeem’s wrath was Basheer. It is apparent that Rauff Hakeem regards Basheer Segu Dawood as his most formidable political adversary nowadays. Basheer is indeed a unique Muslim politician on account of his colourful background. When he became an MP, he was the only Muslim parliamentarian from the East with a history of revolutionary politics as he had at one time been a prominent member of the Tamil militant organization known as the Eelam Revolutionary Organization (EROS). Basheer, son of Segu Dawood (as he frequently describes himself) is from Eravur in the Batticaloa District. Eravur was at the turn of the 19th century a Tamil majority area with a Muslim minority. Today it is a Muslim majority area with a Tamil minority. Eravur, Kattankudi and Ottamavady are the three major Muslim populated regions in the Batticaloa District. Muslim MPs from the Batticaloa District have been regularly elected from these three places in recent times. Gradually Basheer got closer to the upper echelons of the Mahinda Rajapaksa Govt. Shortly after the 2010 elections, Basheer hatched a conspiracy to make some Muslim Congress MP’s defect to the Govt on the eve of the 18th Constitutional Amendment to help provide a two thirds majority to the Govt. Basheer, born on April 17, 1960 was attracted to politics as a student and became a member of the left–leaning Eelam Revolutionary Organization of Students called EROS. It is this student organization that evolved into the Eelam Revolutionary Organization also called EROS. In fact most organizations affiliated to EROS have the same acronym EROS. (Eelam Research Organization, Eelam Refugee Organization, Eelam Rehabilitation organization etc). An off shoot of the EROS was the General Union of Eelam Students (GUES) the forerunner of the Eelam People’s Revolutionary Liberation Front (EPRLF). This penchant for EROS has been jocularly attributed to the movement’s pioneering founder Eliyathamby Ratnasabapathy. It is said in lighter vein that EROS means Eliathamby Ratnasabapathy and Others. The EROS was considered to be the most “intellectual” of Tamil militant movements at one time. It was also the first organization to send cadres for arms training with Palestinian guerillas. 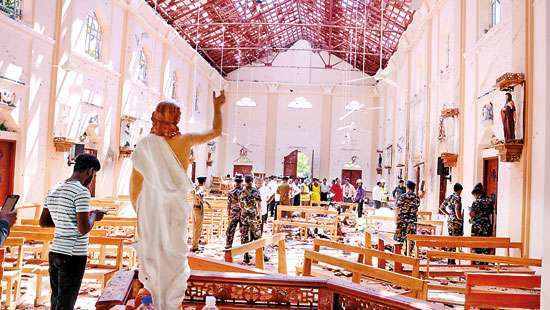 It was also the EROS which pioneered explosive attacks in Colombo. With the passage of time, the greater part of the EROS located on home soil under Balakumar merged with the Liberation Tigers of Tamil Eelam (LTTE) while the overseas component tried to function as an independent entity under Shankar Raji. The EROS ideology as articulated through its journal “Tharkeegam” edited then by “Sinna Bala” and through the book “Eezhavar Idar Theera” written by Ratnasabapathy envisaged an Eelam comprising the Northern, Eastern Provinces and parts of the Uva Province. It spoke of people inhabiting this territory dubbed Eezham as “Eezhavar”. The term Eezhavar applied to all people living in this territory regardless of being Sinhala, Tamil, Muslim, Malay or Burgher. Basheer Segu Dawood joined as a member of the student organization and later rose from the ranks to become a senior intelligence leader of the EROS. His ostensible profession was that of a teacher. With the Indo-Lanka accord of 1987, the EROS entered the democratic political mainstream. In the 1989 Parliamentary polls, the EROS fielded lists of Independents in the North and East. The EROS independents won 12 elected seats and a national list seat. War broke out in June 1990 between the Sri Lankan armed forces and the LTTE after the Indian Army left Sri Lankan shores in March 1990. 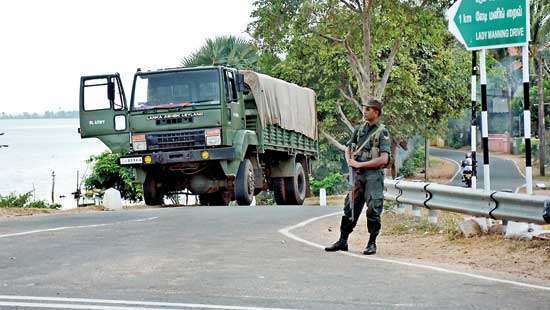 The EROS was issued an ultimatum by the LTTE. The bulk of the EROS merged with the Tigers. The MPs elected on Independent lists stopped attending Parliament and forfeited their seats in due course. The sole EROS MP elected from Batticaloa was Azhaghu Gunaseelan. He too lost his MP status and later migrated to Europe. This enabled Basheer Segu Dawood who had also contested on the EROS independent list to succeed Gunaseelan and become MP. He remained as an Independent MP until 1994 when he joined the Muslim Congress when Ashraff was its leader. Ashraff impressed by Basheer, appointed Segu Dawood to the SLMC politburo. After Ashraff’s tragic demise in 2000, Rauff Hakeem succeeded him. Soon Basheer and Rauff (both born in 1960) established a strong personal friendship and political relationship. Segu Dawood was a sheet anchor to Rauff Hakeem who was attacked by his detractors as an outsider to the Eastern province. Hakeem is from the Central Province and technically not a “Kizhakku Mannin Mainthan”(son of eastern soil). Basheer stood by Hakeem loyally and supported him amidst trying situations. He was a tower of strength to Hakeem when an inner-party revolt was staged against Rauff in 2002 when he was in Oslo for Govt-LTTE talks and also during the Kumari Cooray episode. Segu Dawood’s closeness to Hakeem was by itself an irritant to the anti–Rauff factions. In 2003, Basheer was made the Chairman of the Sri Lanka Muslim Congress. Segu Dawood was, however, not very successful in elections during 1994 and 2000. The bulk of votes from Eravur went to Ali Zaheer Moulana of the UNP. With Hizbullah from Kattankudi and Mohideen Abdul Cader from Ottamavaddy getting a sizable number of votes, Segu Dawood failed to get a sufficient number of preferences to get elected. Basheer became an MP again in December 2001 after being appointed on the SLMC national list. He did not contest polls in 2001. In April 2004, he contested elections but did not win. In September 2004, Basheer was again appointed as national list MP. In 2008 he resigned his seat to contest the first Eastern Provincial poll as chief candidate for the Batticaloa District. The UPFA won and Sivanesathurai Chandrakanthan alias Pillaiyan became Chief Minister. Segu Dawood functioned as Opposition Leader in the council until 2010. After the Parliamentary poll he returned to Parliament as a national list MP. As stated earlier it was during this phase that differences emerged between Rauf Hakeem and Basheer Segu Dawood. Today these differences have reached a level where Hakeem regards Basheer as his greatest political enemy. Recent events demonstrate that Hakeem’s assessment about Segu Dawood may prove correct. The latter has released two “bombshell” statements within the past two weeks. In the first, he stated that he would not seek office at any level hereafter. He would not contest elections or be appointed as a national list MP. He would be content to serve the people and party as a bottom rung activist. By this statement he indicated that he would not accept any MP post or ministerial or Provincial Councillor office in the future. He was in effect saying that his dispute with Rauff Hakeem was not over the national list MPissue and that he was not hankering after political office. In the second announcement, he clarified his political stance further. Relinquishing political office did not mean that he was quitting politics. On the contrary he was going to remain in politics as a member of the SLMC. He would now undertake a campaign to cleanse the party and its politics. He would engage in an attempt to purify the party. What Segu Dawood is exactly planning to further his goal of purifying the SLMC remains a mystery at present. However it appears that he would be taking the moral high ground vis a vis Rauff Hakeem as the man who has renounced the trappings of power and is concerned only about the well –being of the party and people. It is surmised that Basheer Segu Dawood would swing into concrete action after the Ramadhan fasting season is over and the Eid Festival is held on July 7. The avowed objective of cleansing or purifying the party does not pose a political threat to Rauff Hakeem in the short term. However it has the potential to undermine Hakeem’s authority and leadership in the long run. If Segu Dawood is successful in his quest, Rauff Hakeem may not be able to run the SLMC in an authoritative manner as he is often accused of doing. The High Command would become more representative and more independent. It would not be packed with Rauff Hakeem’s political lackeys as it is now. Decision making would be more democratic and consensual according to “Shoora”principles. If the course of events take a far more serious direction, there is even a chance of Hakeem being replaced as SLMC leader. 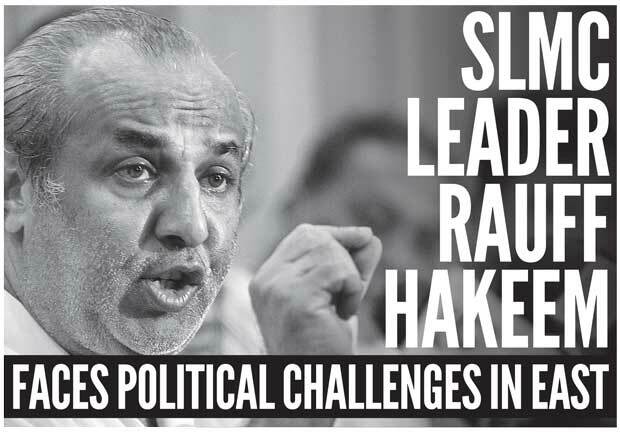 Even as Rauff Hakeem locks horns with Basheer Segu Dawood and Hassan Ali at leader level, a new challenge seems to be emerging from within the SLMC rank and file against Rauff Hakeem’s political leadership. A movement called “kizhakkin Ezhuchchi” (Rise of East) is now gathering momentum in the Muslim majority Amparai District. It is spreading to the Batticaloa and Trincomalee districts also. Coordinating committees are being formed rapidly in various Muslim localities. The livewire behind the movement is a senior SLMC activist Waffa Farook from Kalmunai. The objective of the movement is to regain the leadership of the Sri Lanka Muslim Congress for the Eastern Province. Its guiding slogan is a quote from a speech by the legendary M.H.M. Ashraff that the rise of the Muslims must originate from the East. The Rise of East movement does not seek to confront the SLMC or act as an external outfit opposed to it. What it seeks to do is to take over the SLMC leadership from within and re-structure the party. It refers to the SLMC as “Namathu Nambikkai Maram” meaning “our faith is the tree”. The tree is the accredited electoral symbol of the SLMC. The rise of the East movement also proclaims “Namathu Katchiyai Meetpoam”(Let us Liberate our party). A booklet with 37 questions for Rauff Hakeem has also been published. All this means that the movement wants to take control of the SLMC and change the leadership. If the movement has its way, Rauff Hakeem, the Kandyan Muslim would have to step down in favour of a leader hailing from the East. Rauff Hakeem has faced many challenges to his leadership in the past. All his contenders like Ferial Ashraff, A.H.M. Athaullah, Rishard Badiutheen etc., broke away from the SLMC and formed new parties. In Ferial Ashraff’s case, she took over the National Unity Alliance (NUA) newly formed by M.H.M. Ashraff as an umbrella organization and let Rauff Hakeem keep the SLMC. Athaullah and his supporters formed the Muslim National Congress now known as the National Congress. Badhiutheen and his supporters formed the All-Ceylon Muslim Congress now known as the All Ceylon People’s Congress. Though these parties did make some headway they could not dislodge the Sri Lanka Muslim Congress as the premier Muslim political party. This was mainly because the Muslim Congress and its symbol the tree had become firmly established as the political party of the Muslim people, particularly the Eastern Muslims. A remarkable aspect of recent Muslim politics has been the consistent steadfastness of Muslim Congress supporters on the one hand and the fickleness of those elected from the party on the other. The people remain loyal to the party but some of those elected are disloyal to the leadership and by extension to the party. Division and fragmentation has been the bane of the SLMC in recent times. Yet the Muslim people have constantly stood by the SLMC and its leader Rauff Hakeem. The situation is somewhat different now. The “Kizhakkin Ezhuchchi” movement does not project itself as an alternative to the SLMC. It only wants to replace the current leadership with someone from the East. Likewise Basheer Segu Dawood also does not want to form an alternative party like Athaullah or Badhiutheen. Neither Basheer nor Hassan Ali want to quit the SLMC. They want to remain in the party and fight it out with Rauff Hakeem from within. In this there is a striking similarity between the politicial approaches of Basheer Segu Dawood and the “Rise of the East”movement. There is no evidence of direct links between Segu Dawood and the “Kizhakkin Ezhuhchi”movement so far. Only time will tell whether there is indeed a Basheer connection in the Rise of the east movement. Interestingly the Rise of the East movement would also not be liked by Rauff Hakeem’s arch rival in the Cabinet. Industries and Commerce Minister Rishad Bathiudeen is also the leader of the All Ceylon Makkal (People’s) Congress (ACMC). The ACMC has five MP’s in Parliament and is viewed as the alternative to the SLMC by some. In recent times, the ACMC has been engaged in strenuous efforts to enlarge its vote bank in the East. The party won an MP seat in Trincomalee and another in Batticaloa. It narrowly missed getting an MP elected in Amparai District. Currently there is a concerted campaign on to project and promote Rishad Bathiudeen as the leader of the Sri Lanka Muslims. However the rise of the “Kizhakkin Ezhuchchi” movement could affect Bathiudeen’s ambitions too as he too is not from the East. Rishad Bathiudeen hails from Mannar District in the Northern Province. If Rauff Hakeem cannot be the Muslim leader, because he is not from the East, then Rishad Bathiudeen also cannot be the leader as he too is not from the East. What is sauce for the Kandy District gander has to be sauce for the Mannar District goose too. What is blatantly clear from all these political developments is that a situation is fast evolving where Rauff Hakeem’s political leadership could be severely undermined. The various rivals of Hakeem in the east like Athaullah, Hizbullah, Ameer Ali and Najeeb Abdul Majeed could all gang up together against him. Basheer Segu Dawood has the political acumen to unify these diverse elements with the sole purpose of toppling Rauff Hakeem. A raw appeal to Eastern Muslim sentiments could tug at the hearts and minds of the average eastern Muslim. When these sentiments are mixed with resentment at perceived autocratic conduct of Rauff Hakeem as SLMC leader, the end result could be potently explosive. Rauff Hakeem has been at the helm of the Muslim Congress for over 15 years. It is difficult to predict what he would do as the SLMC chief generally plays his cards close to his chest. However there are two things he is likely to do in the near future. One is to renew efforts to make peace with the General Secretary and fracture the Hassan Ali-Segu Dawood axis. Hassan Ali is a highly-respected leader with many supporters in the SLMC. Antagonising Hassan Ali permanently would be a serious blunder. The other move is for Hakeem to consolidate himself further by enticing key Eastern Muslim individuals who broke away from the SLMC and dissidents in other parties into the party again. Hakeem requires strong backing from Eastern Muslim leaders to counter the twin threats of Segu Dawood and Rise of the east.